Grayling are native to North Hemisphere region and in North America they are native to north of Canada, Michigan and Missouri drainage. In Wyoming grayling have been introduced to many large lakes. Even though the grayling are cold water fish, in Wyoming as they survive best in shallow lakes, they are present in shallow lakes of Wyoming and in these shallow lakes they can survive at medium summer temperatures. In Wyoming the grayling are generally found Meadow Lake and this lake is the best place for grayling and for this reason this lake serves as the egg storing place of graylings’ so that they can be introduce to many other places. HOW TO CATCH GRAYLING IN WYOMING? Graylings, like other fish species in Wyoming usually feed on insects and can easily be fished using small flies and spinners. The Wyoming record for grayling is about 2 kg and 70 gram. Arctic grayling is a type of grayling that is highly available in the lakes of Wyoming and fly fishing is perfectly ideal if you are after this great fish. Grayling are also a commonly used game fish in Wyoming. If you are planning on fishing for grayling in the winter this fish is perfectly ideal for fly fishing anglers. However as the clear days with clear low water are ideal for grayling anglers, fishing for them in winter might be a real challenge. Grayling usually stay at the bottom of waters and generally feed on worms, nymphs, shrimps, flies, spiders and many other things. 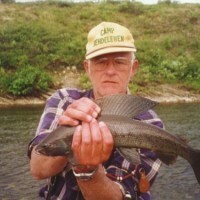 Overall grayling fishing in Wyoming would be a real adventure for your weekends and holidays. With many services offered in Wyoming you will be enjoying your time to the full limit.